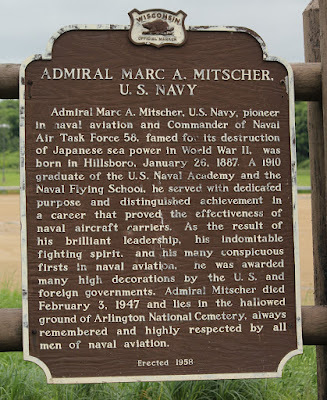 Admiral Marc A. Mitscher, U. S. Navy, pioneer in naval aviation and Commander of Naval Air Task Force 58, famed for its destruction of Japanese sea power in World War II, was born in Hillsboro, January 26, 1887. A 1910 graduate of the U. S. Naval Academy and the Naval Flying School, he served with dedicated purpose and distinguished achievement in a career that proved the effectiveness of naval aircraft carriers. As a result of his brilliant leadership, his indomitable fighting spirit, and his many conspicuous firsts in naval aviation, he was awarded many high decorations by the U. S. and foreign governments. 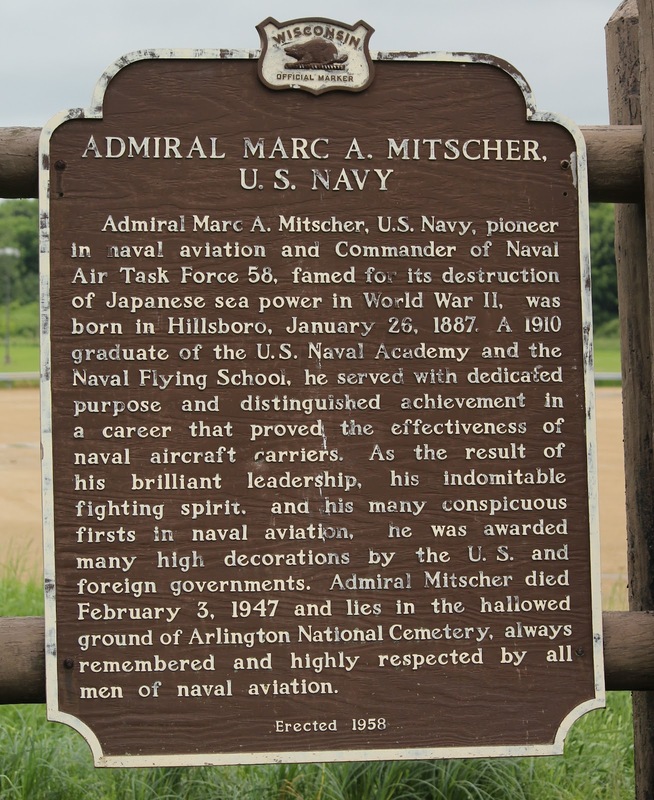 Admiral Mitscher died February 3, 1947 and lies in the hallowed ground of Arlington National Cemetery, always remembered and highly respected by all men of naval aviation. The marker is located at a pull-off on eastbound Lake Street (State Highway 33/82), just west of Elm Avenue (to the south) and School Road (to the north), Hillsboro, Wisconsin 54634. The marker is located in Hillsboro, Wisconsin.